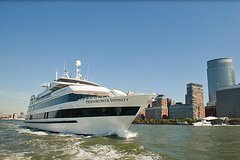 With live jazz music, a robust brunch buffet and bottomless sparking wine and mimosas, this relaxing Manhattan brunch cruise makes for a perfect Sunday outing in New York City. Enjoy first-class service as you cruise down the Hudson River and admire unbeatable views of the Statue of Liberty, Ellis Island, the Brooklyn Bridge and more. Make your way to Pier 40 at Hudson River Park in Manhattan and board the sightseeing yacht for your 2-hour Sunday brunch cruise. As the boat departs, enjoy picture-perfect views of New York while you coast down the Hudson. Enjoy bottomless sparkling wine, mimosas and mineral water served throughout your cruise by attentive waitstaff, and relax to jazz music performed by a live band. Watch the Lower Manhattan skyline glide past as you fill your plate with brunch buffet items, which includes a cheese board, charcuterie selection and carving stations (see below for a full sample menu). Then indulge in an assortment of desserts paired with signature coffee or tea. While you dine, float by iconic New York landmarks such as the World Financial Center, the Empire State Building and the Chrysler Building. Head to the outer decks to sip your bubbly with a fresh-air view. You’ll cruise past Liberty Island in New York Harbor to see the colossal Statue of Liberty, and spot Ellis Island and the Brooklyn Bridge, before arriving back at Pier 40.